Adored by both Big Oil and Donald Trump, EPA Administrator Scott Pruitt is the ultimate example of what happens when corrupt public officials side with corporate polluters instead of protecting the American people. Whether tearing apart climate change regulations or making it easier to spread toxic pesticides, Pruitt stands out as the most dangerous and effective member of Trump’s cabinet. As Attorney General of Oklahoma, Pruitt brought an unprecedented 14 lawsuits against Obama Administration environmental regulations. As EPA Administrator, he has made it abundantly clear that his mission is to “get rid”of the agency itself. In a recent report, Pruitt gloats that he presided over the dismantling of 22 separate environmental regulations. Before he makes it to number 23, he must be stopped. Pruitt stands out as the most dangerous and effective member of Trump’s cabinet. Plagued by scandal and facing growing criticism even from members of his own party, the moment is ripe for communities across to country to rise up and demand that Scott Pruitt be fired. We can’t wait until 2020 or even until November. The work must begin now. Here’s why. #1: Travelgate. Scott Pruitt likes to travel. A lot. And he likes to do it in the lap of luxury on the taxpayers’ dime. He took a trip to Italy for the G8 Summit, but managed to find time for a guided tour of the Vatican and a pasta-making lesson. A few months later, he took a trip to Morocco to hawk US liquefied natural gas exports — a big favor to the fossil fuel industry but about as far as you can get from the EPA Administrator’s job description. He also likes to go home on the weekends, racking up an impressive ten trips between Washington DC and Oklahoma in his first three months as administrator alone. 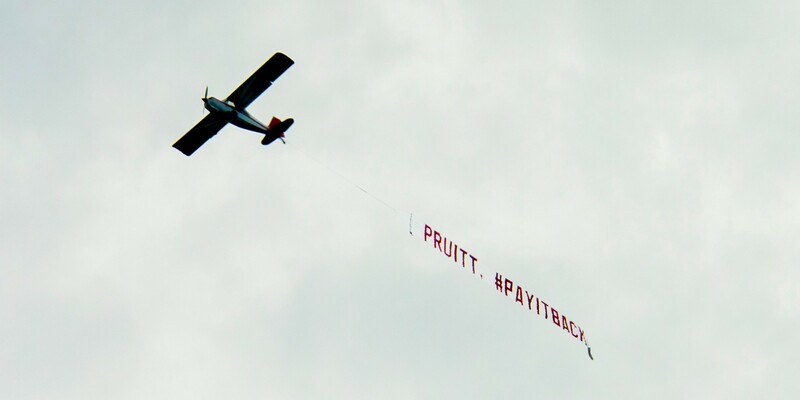 Friends of the Earth flew a plane over Pruitt’s Big Oil meeting, telling him to pay back taxpayers, Oct. 2017. These trips have come at a hefty cost to taxpayers, largely because Pruitt has a habit of using either military, charter, or first class flights. In his first four months as Administrator, he spent $58,000 on four charter flights, and in June 2017 alone he spent $90,000 on travel. He has claimed that his extravagant use of first class is for safety reasons, but aviation security experts are skeptical and the EPA’s own Inspector General has opened a broad inquiry into Pruitt’s globe-trotting. At this point all the evidence points to a clear violation of federal guidelines. #2: Dwindling Enforcement. Holding polluters responsible when they violate our bedrock environmental laws is possibly the EPA’s most important job. Unfortunately, Pruitt seems determined to make sure that the agency does the exact opposite. Since Trump’s inauguration, enforcement actions at Pruitt’s EPA have collapsed. According to the Environmental Integrity Project, a mere 48 civil cases were lodged against polluters during Pruitt’s first year, bringing in only $30 million in penalties. For reference, even the second Bush Administration managed to bring in 112 cases and extract $50 million during its first year. Part of the reason for this decline is the unprecedented concentration of power Pruitt has given to himself and his political appointees. Career EPA officials accustomed to taking the lead on enforcement cases are no longer even allowed to request information from regulated businesses like power plants and refineries. These simple data requests, often the basis of civil enforcement actions, must now be run through EPA headquarters, another example of how the agency has become a dangerously politicized. #3: Secret Phone Booth. Facilities for the EPA Administrator to handle classified information or place a call without being overheard have existed at EPA headquarters long before Pruitt. But apparently those facilities weren’t good enough, because not long after his confirmation, Pruitt had a $43,000 sound-proof phone booth installed in his office. Considering that this is a man who spent most of his career in collusion with Big Oil, you have to wonder who exactly is he calling? An investigation is underway into whether or not the purchase was illegal, but whatever the outcome, it is certainly suspicious. #4: Superfund. Scott Pruitt has claimed that the Superfund program is a priority, even appointing a “task force” to produce a list of recommendations to improve the program. Unsurprisingly, the recommendations would largely benefit the polluters themselves. There are strong indications that the new recommendations would prioritize sites with economic redevelopment potential and allow polluters responsible for cleaning up Superfund sites to shift their financial obligations onto third parties, all while giving the notoriously polluter-friendly Pruitt himself extra influence to intervene directly in the most expensive and controversial clean-ups. 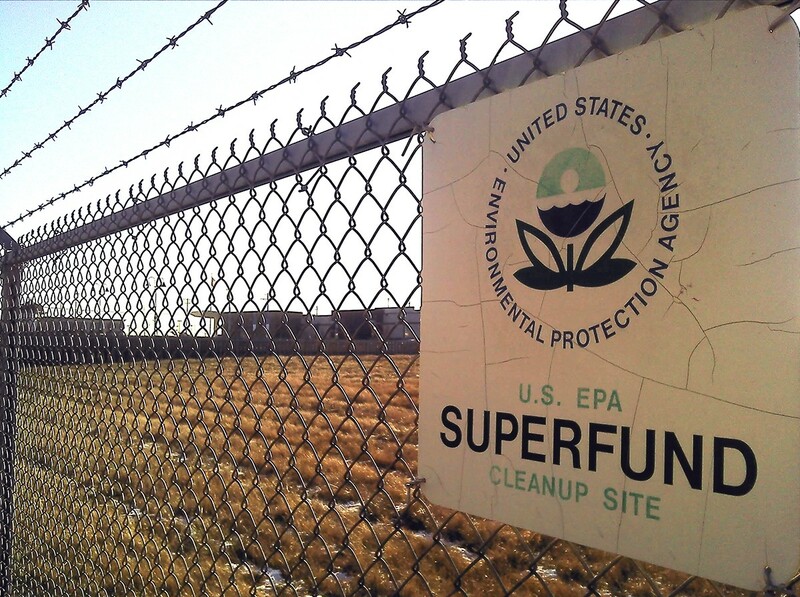 EPA Superfund site. Photo via Bloomberg Law. Even worse, the entire review effort was supervised by long-time Pruitt crony Albert Kelly, a disgraced former banker from Oklahoma with no experience in superfund or environmental policy at all. Financial disclosures show that he owns stock in companies responsible for some of the largest superfund sites in the country — and that isn’t even the most scandalous thing about him. Just before he began work at the EPA, Kelly was fined $125,000 by the Federal Deposit Insurance Corporation for undisclosed regulatory violations. A few weeks after starting at the EPA, he was banned for life from the banking sector. And it gets even dodgier. Kelly gave Pruitt various mortgage and business loans. Congressional investigators are now trying to determine whether that played a role in Kelly’s appointment, though they’re getting little cooperation from Pruitt’s end. #5: Politicizing Grant Money. Giving out grant money is actually one of the EPA’s biggest jobs. It funds everything from clean water infrastructure to university research on toxic chemicals. The bad news is that under Pruitt, the normally sleepy and bureaucratic process of issuing competitive grants is becoming dangerously political. In an unprecedented move, Pruitt appointed Assistant Administrator for Public Affairs John Konkus to supervise competitive grants at the EPA. Since taking the job, he has imposed Trump Administration priorities — including ordering his staff to eliminate references to the “double c-word,” or “climate change,” from new grant solicitations. Like Albert Kelly, Konkus is a man of scandal. Cashing in on his previous connections as a consultant and Trump campaign operative in Florida, he has been taking on private consulting gigs as side-jobs while still working at the EPA. Worst of all, his list of clients are allowed to stay confidential, meaning that the inevitable conflicts of interest likely to arise may remain secret. #6: Replacing Scientists with Polluters. Last October Pruitt issued a directive banning scientists who receive grant funding from the EPA from serving on any of its advisory boards. Now, Pruitt is free to fill the advisory boards with industry insiders who are concerned with corporate bottom lines, not environmental protection. Since 1978, the EPA has looked to its Scientific Advisory Board for input on regulations and research priorities. It is one of 23 independent panels composed of experts in their respective fields meant to provide neutral advice to the EPA. Tellingly, Pruitt picked a Texas state official who thinks smog isn’t that bad to chair the Scientific Advisory Board. This is classic Pruitt. When he was Attorney General of Oklahoma, he became a notorious instrument of Big Oil. Most famously Pruitt copy-and-pasted a letter from fracking giant Devon Energy and sent it to the Obama’s EPA on his own letterhead. Protestors at the D.C. People’s Climate March, April 2017. #7: Bigotry and Racism. Recently unearthed audio from Pruitt’s days in the Oklahoma legislature shows that Pruitt holds beliefs that should disqualify him from holding any public office. He claimed that gay marriage should be illegal, and that Islam isn’t really a religion. #8: Denying Evolution: The same audio recordings from Oklahoma show that Pruitt doesn’t believe in evolution — tremendously worrying for the leader of a scientific agency. #9: Climate Denial. Scott Pruitt is a climate denier, plain and simple. As Attorney General of Oklahoma, he led the charge against EPA climate regulations. Since becoming EPA Administrator, Pruitt has picked apart those same regulations from the inside. The Clean Power Plan, Obama’s landmark climate regulation to reduce power plant emissions, was one of his earliest targets. One of the ways that Pruitt has taken climate denial to new lows is by denying the costs of climate change itself. He has done this by targeting the “social cost of carbon,” which is a per ton estimate used by the Obama Administration to calculate the economic value of preventing carbon pollution. In 2015, it was estimated at $36 per ton. That figure was used to model the economic costs and benefits of numerous federal regulations, including the landmark Clean Power Plan. Unsurprisingly, the Trump Administration released an executive order in March withdrawing the previous estimates. This in turn gave federal agencies like the EPA a free hand to skew the cost of carbon pollution and make their climate-killing deregulatory agenda seem like an implausibly good deal. In one particularly egregious example, Pruitt’s EPA estimated the social cost of carbon to be as low as $1 per ton in 2020, and then used this ridiculously lownumber to calculate the benefits of repealing the Clean Power Plan. Previously, the Obama Administration had estimated the 2020 cost per ton to be $45. The good news is that a group of senators led by Sheldon Whitehouse are suspicious and have requested the Government Accountability Office to look into Pruitt’s alternative math. Scott Pruitt is a climate denier, plain and simple. #10: Dow’s Dirty Work. 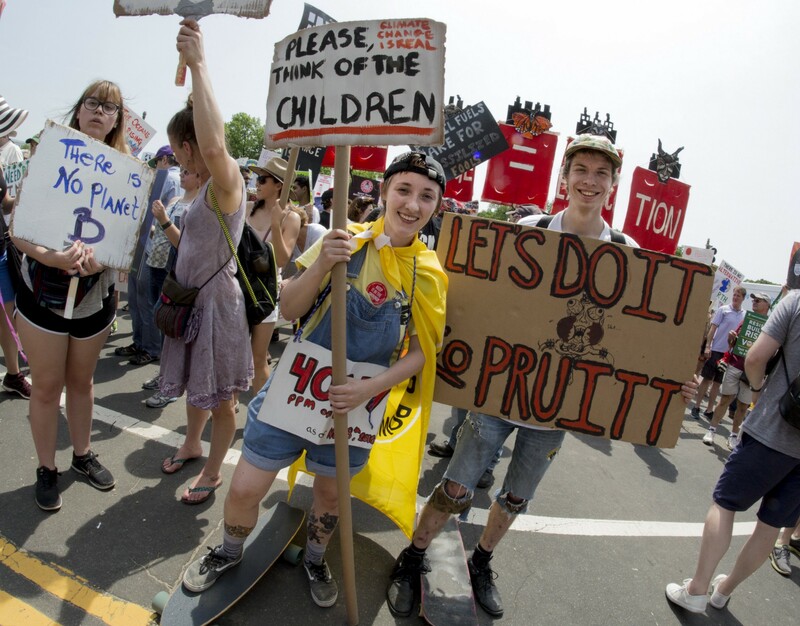 It’s undeniable that the desires of chemical companies and agribusiness corporations are more important to Scott Pruitt than children’s safety. Last spring, Scott Pruitt removed the EPA’s ban on chlorpyrifos, a toxic nerve gas pesticide that’s been shown to cause brain and nerve damage in children. Just a month prior to his decision, Pruitt met with the CEO of Dow Chemical, the manufacturer of chlorpyrifos. Pruitt is also trying to loosen a pair of regulations that protect teenage farmworkers from exposure to pesticides. Conclusion. With his record at the EPA, Scott Pruitt isn’t fit to be a public servant of any kind. Pruitt’s political ambitions are well known: he’s long expressed interest in replacing Jeff Sessions as Attorney General, and rumor has it he’s even looking into a presidential run in 2024. We need to take action now — in the streets, in Congress, and in the courts — to make sure that Pruitt’s next job involves a one-way ticket back to Oklahoma, and quick. We need to #FirePruitt! Take action now.